Born in the Val d’Orcia region of Tuscany, Francesco di Giorgio e di Lorenzo, called Vecchietta or Lorenzo di Pietro, was a Sienese painter, sculptor, goldsmith and architect. Much of his work may be found in Siena, particularly at the Hospital of Santa Maria della Scala, earning him yet another name: pittor dello spedale (or "painter of the hospital"). It is said that he trained under several artists such as Il Sassetta (1392 – 1450), Taddeo di Bartolo (1362 – 1422), as well as, Jacopo della Quercia (1374 – 1438). In the Siena Hospital, now a museum complex, Vecchietta painted a series of frescoes, assisted by Domenico di Bartolo (1400 – 1445), a nephew of Taddeo Bartolo, including The Founding of the Spedale and The Vision of Santa Sorore, depicting a dream of the mother of the cobbler Sorore, the mythical founder of the Hospital. Later, around 1444, Vecchietta individually created the Cappella del Sacro Chiodo, also known as the Old Sacristy, as well as an enormous bronze ciborium for the hospital. He also executed frescos and sculptures for the Siena Cathedral and sculptures in the Palazzo Saracini and for the Church of San Domenico in Siena. 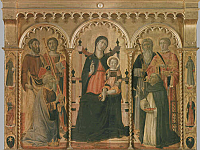 Additional to these works in Siena, his chief work outside the city, includes a painting of the Assumption from 1451 for the church in Pienza in the Val d’Orcia region. A panel from the work, signed and dated 1457, is the Madonna and Saints and now in the Uffizi Gallery. He is also known for his illuminations of the poet Dante’s Divine Comedy, seen now in the British Library of London. 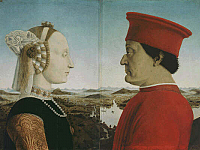 His prominent pupil was the Sienese artist, Francesco di Giorgio (1439 – 1502).